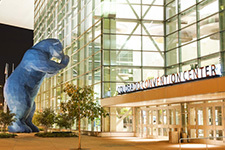 The American Thoracic Society’s 2015 International Conference will take place May 15-20 in Denver. Register by May 14 and save up to $100*. Confirm your accommodations at an official ATS hotel of your choice. Learn more about the Exhibit Hall. Pre-register and reserve your seat in postgraduate courses, sunrise seminars, the thematic seminar series, meet the professor seminars, workshops, assembly dinners, and much more. Purchase tickets for the Seventh Annual ATS Foundation Research Program Benefit. Purchase your Bistro ATS lunch tickets. Call Convention Data Services at 866-635-3582 (9 a.m. to 5 p.m. EDT). Callers outside the U.S. and Canada may dial 508-743-8518. For international groups of 10 or more, dial 508-743-8519. Fax a registration form to 508-743-9673. Online registration is recommended, but registration forms are available at the conference website. Registration by phone or fax requires a credit card. *$100 Savings reflects the difference between Full Member Late Advance Registration and Full Member Onsite Registration before any additional purchases and/or fees.